I’ve said it before – animal lovers are the best people! 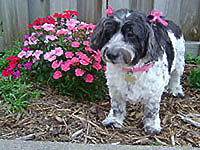 Over the years, many of them have sent pictures of their special furry companions. While some of these critters are still with their people, many of them are now flying through the heavenly skies. 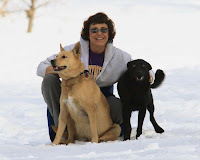 It’s easy to see how much Carol Vogel is enjoying this moment with her two beloved rescue dogs, Cookie and Sunny. Carol works with the Good Samaritan Pet Center in Denver, CO. Working with a network of foster parents, this organization provides “shelter alternatives” for homeless animals until permanent homes can be found. If you are in the Denver area be sure to get in touch with them – http://www.goodsamaritanpetcenter.org/. There are so many shelter animals who are waiting for their forever families to find them. If you are looking to bring some love….and fur…into your life, please visit your nearest animal shelter.